Fish in batter is a timeless British dish, but with our fantastic collection of recipe s, there's no need to go down to the local chippie to get your fish and chips fix. 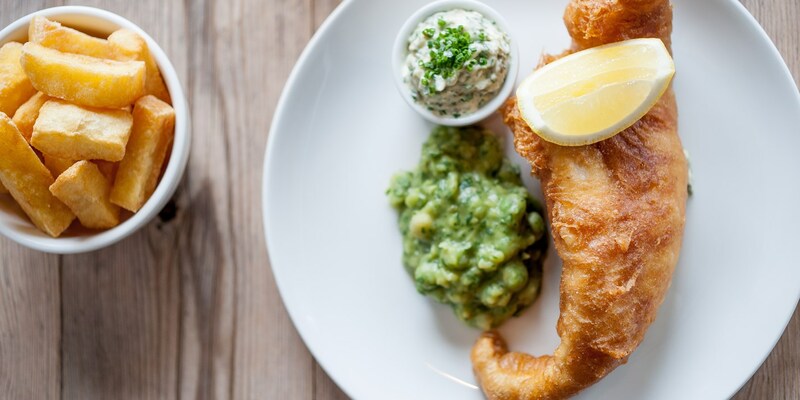 Keep it traditional with Josh Eggleton's beer battered haddock, while renowned seafood chef Nathan Outlaw prefers hake in his fish and chips. To keep the whole family happy, there’s Luke Tipping’s cod popcorn and Shaun Rankin’s quirky fish fingers in lemonade batter, giving a light and fluffy batter with a slight lemony kick. Our fish and chips recipe collection also has some more elegant options that would be perfect for a dinner party, from Nigel Haworth’s beer battered crab claws in his Muncaster crab dish, to Chris Horridge’s oysters in crispy tempura batter, or even Vivek Singh’s Amritsar-spiced Alaska halibut recipe to turn up the heat.